It’s easy to write in a bubble where everything we write sounds good. As Nthato mentioned, being a part of a group helps to vet story ideas, receive beneficial feedback, and build a supportive network with other writers. These are essentials for good writing and helping to stay motivated. I’m part of a writer’s group. Several in fact, although I’m far more active in the more social group than the others and that’s just because it’s more convenient for me. The great thing about writing groups is being able to share writing and let others give insight as to what you wrote. A lot of times we talk through ideas, explain what an official sending address looks like, what sites are perfect for getting people’s names, and occasional debates about Twilight, Fifty Shades, and other heated topics. *I may have played the devil’s advocate on a number of occasions. The Emotions Thesaurus has been the greatest tool in my arsenal. Sometimes I know what emotion to write about, but have a hard time illustrating the body language. I rummage through my head for situations where I felt like the character, but the past actions I used escapes me. This handy book takes the stress out of guessing and remembering. It’s definitely helpful with showing instead of telling. The only thing I wish could be different is for new editions with added emotions such as grief. 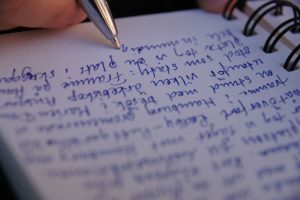 I didn’t get to do this kind of post, a review of sorts about writing guides/books. I’d planned to last year but better late than never, right? Besides, it’s long overdue to shout from the mountain tops how much I love The Emotions Thesaurus. I love how it reminds the writer all the ways a character can speak without the use of their mouth. When I got back into the writing game after a long detour, I admit my characters were one dimensional. They spoke but they rarely moved on the page. Literally and figuratively. And then I purchased this wonderful book and my eyes were re-opened. I remembered that body language too spoke volumes. Writing is one of those things that can be a lone task. We’re in our heads creating plots and developing characters, figuring out how to paint pictures with words others can read, see, and feel. But does writing have to be an introverted undertaking? Of course not. As mentioned in Lisa J. Jackson’s post about meeting other writers, there are a plethora of avenues online and local for writers to connect. This can be great for support and feedback as well as developing professional and social relationships. But is online more beneficial than off? Sometimes when writing, I run into a brick wall in search of a better word or emotion, or want to check how well my writing will read. Below are a list of resources that I use for those occasions. It is said that most adults read at an 8th or 9th grade level. These vocabulary list are words that students are expected to know by the end of each grade. I have to admit after reviewing, I did learn a thing or two. If you’re looking for the right emotion for your character, but can’t put a finger on it, look no further. These lists include most emotions with descriptions.